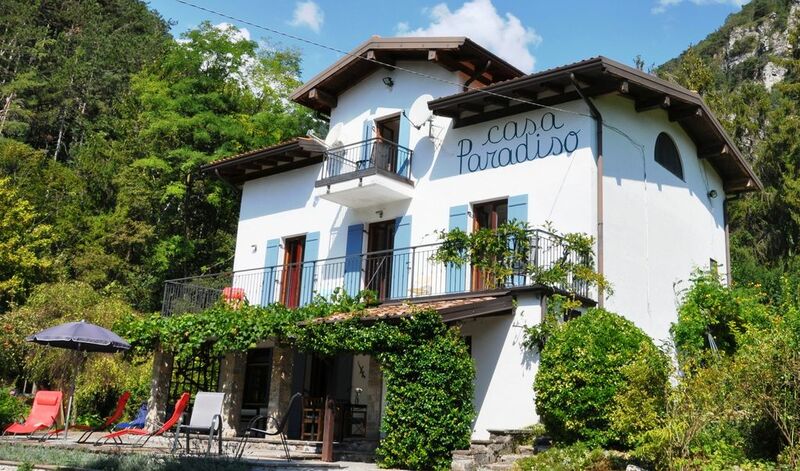 Casa Paradiso is a well equipped 4 bedroom villa for 9 set in beautiful grounds in a national park above Lake Garda. The villa provides a private and relaxing haven after a busy day by the Lake, and is only 5 minutes by car from shops, pools and sports activities. Over the years we have found its especially popular with families, biking / sports enthusiasts and pet owners. The villa comfortably sleeps 9 (including 1 infant) with 4 bedrooms and 2 modern bathrooms. It has around 600sqft / 60 sqm of entertaining space including a large living room with fireplace, a dining room for 10 and a well equipped kitchen. The living room has several comfortable sofas arranged around the fireplace (wood provided) and is furnished with family games, WiFI and satellite TV. Three of the four bedrooms have French windows onto a large first floor south facing balcony. Outside there are two covered dining areas, one with an outside fireplace and BBQ and the other south facing with a wonderful view of Monte Baldo and covered with grape vines. The house is ideal for families with lots for the kids to explore; a mountain stream and woodland to play in; a climbing frame, slide and swing in the meadow; and 5 minutes drive to two wonderful outdoor swimming pools (both with bars). In the evenings, if we are not cooking on the BBQ next to the outside fireplace, our kids play board games or football on the meadow. We also have a child seat and cot. The house is large enough for two families or to bring the grandparents. It is also popular with guests who bring their dogs on holiday and who love the large grounds and peacefulness. There are many sporting opportunities on the doorstep including mountain biking on the famous "Passo Nota" and "Passo Tremalzo" routes or hiking on the many well marked trails around the house. Within 5 minutes drive are tennis courts, bike rental and 2 excellent outdoor swimming pools. For the more adventurous, close nearby is the highly rated Skyclimber centre for climbing, rapelling and canyoning and the well known free-climbing zone at Arco. We also frequently drive down to the lake to windsurf / kitesurf at the sailing centre at Campione, enjoy the beach at Limone, or sail or take out a pedalo at Riva. The nearby supermarkets, restaurants and bank of Vesio are 5 minutes by car. We also often eat out at the excellent local restaurant 3 minutes walk away (Val d'Egoi). Nearby are the 18 little villages of Tremosine and the world famous Strada della Forra - a breathtaking road down to the lake which Winston Churchill described as the 8th wonder of the world. We also often spend days by the lake shopping in Riva (which has an ancient castle and a weekly market) or catching a ferry from Limone across the lake to Malcesine (which has many specialist leather shops and a cable car up Monte Baldo). Especially in the high season after a day in the heat and bustle of the Lake we enjoy returning to the peacefulness and cool of the house. The house is approached up a gravelled avenue lined with trees between a mountain stream and an organic flower meadow and has parking for four cars on the driveway. After crossing the south facing sun terrace planted with lavender and equipped with loungers and chairs, you enter the house through a covered dining area sheltered with vines. Round the side of the house is the sheltered outside fireplace and barbeque, both perfect for late nights in front of a fire under the stars, when there is usually a cooling breeze from the mountains. The comfortable living room is fully equipped with sofas arranged around a traditional Tyrolean ceramic fireplace, where we play board games, watch the flatscreen satellite TV, use the intenet or listen to music. Next door is a large dining room for 10, with a small library, which leads into a well equipped kitchen. The kitchen has an electric oven, a 4 ring gas hob, a large fridge / freezer, a dishwasher, a kettle, a toaster, a coffee maker, and a microwave and we provide a range of dishes, cutlery, pans and kitchen utensils. On the ground floor there is also a WC. Up the stairs on the first floor are three of the four bedrooms, each of which has French Windows leading out onto a large first floor south facing balcony covered with vines and wisteria. The balcony is equipped with a table, several chairs and sun loungers and is a favourite spot for lying out in the sun listening to the stream or watching the sun set over the mountains. Two of the rooms have double beds (Kingsize and a large double) and one bedroom has two singles in a bunk bed as well as a cot. Each bedroom has a wardrobe, mirrors and reading lights. On the first floor there is also a modern bathroom with a shower as well as a separate laundry room with a washing machine, iron and ironing board. Up the stairs on the second floor there is a further double bedroom (with a Queensize bed) next to a second modern bathroom equipped with a shower and hairdryer. In total the house has around 2,200 sqft / 220 sqm and all beds are proper beds not sofa beds. Towels and linen are included. The grounds of over 2 acres are mostly covered with wild flowers and fruit and walnut trees and provide direct access to a well marked network of hiking paths and roads in the national park. The garden and meadow are a haven for butterflies and wildlife. Our favourite trips from the house including walking or cycling up to the bar at Passo Nota which in 1914 was the border with Austria, hiking up behind the house to the ruins of Arsone where our stream springs from the mountain, or circuit training at the park's nearby picnic area. We are a family of five, with three daughters aged between 14 and 20 and live in London. We bought Casa Paradiso around 10 years ago, after living and working in Italy in the 1990s, because we love the combination of the peaceful and beautiful location and the many experiences and activities around Lake Garda. Please feel welcome to email, phone us or look at our website casaparadisogarda.com. We are happy to accept payment through the site's online payment or direct - whatever you prefer. We chose Casa Paradiso because of its beautiful private location close to the local villages and the lake and the opportunities for us and the kids to pursue active recreations like mountain walking, mountain biking and tennis as well as lying by a pool and eating wonderful Italian food and wine. We stay 4 to 5 weeks each year. Shower room on 1st floor with shower, WC and basin. Bathroom on 2nd floor with shower, WC and basin. Separate WC on ground floor. The holiday resort towns of Limone, Riva and Malcesine are all nearby. the GardaLand amusement park is on the south coast of the lake. The nearest village, 5 minutes drive away, is Vesio which has a bank, 2 supermarkets and several bars and restaurants. Electric oven, 4 ring gas hob, fridge / freezer, dishwasher, kettle, toaster, coffee maker, microwave etc. The dining room is next to the kitchen and contains a large table with seating for 10. Child seat. Bedrooms 1 to 3 all have French windows to a large first floor south facing balcony covered in grapes. Casa Paradiso definitely lives up to its name. The house is situated in a beautiful mountain landscape, approximately 20 mins. drive from Lake Garda. It was a little tricky to find at first, but its peaceful location is the perfect place to spend a relaxing holiday. Just to step outside the door in the morning with a cup of coffee in hand and look out over the flower meadow to the mountains beyond, to the sound of the stream trickling over the rocks, is the perfect way to start the day! We have never seen so many bees and butterflies. For a family of 3 generations, which included 2 children aged 9 and 11, there was plenty for everyone to do: walking, mountain biking, river walking, spending time on the beach in Limone, kayaking, swimming in the lake and in the two pools in Vesio, taking the ferry over to Malcesine and the cable car to the top of the mountain, relaxing on the terrace - even building a fairy house by the river! The house is large, very clean and well equipped and easily accommodated our family of 8 people. We stayed for one week, but take my advice and stay longer! The photographs don't do Casa Paradiso justice. It's a large, beautiful and tastefully designed & appointed family villa set in over a hectare of its own grounds made up of trees, lawn and meadow grasses. It's in an arresting location near the mountain village of Vesio where you will find all essential services and facilities. The beautiful views from the house are down towards the tiny Valle di Bondo and across to Monte Baldo on the other side of Lake Garda. Lake Garda's main towns and villages are busy with people and traffic for most of the traditional tourist months and it was an utter delight to return to Casa Paradiso's quiet beauty, space and tranquillity after a day in the busier tourist 'honeypots'. We spent a lot of time exploring the local mountains (around Casa Paradiso) on foot and on mountain bikes. You could quite easily spend a month there and still find new paths/tracks. There's something for all abilities nearby, and if you come from Britain you'll be surprised to find peaks just below 2000m altitude more or less on the doorstep of the villa. We did a fair amount of windsurfing too, something Lake Garda has a well deserved reputation for. Pick a bright sunny day and turn up at one of the windsurfing places a little after midday when the wind kicks in. 'Die-hard' windsurfers may want to try an early morning session (6am) when the wind is reliable. There really are few places better for windsurfing than Lake Garda. The villa has spacious and bright bedrooms, most with balconies. The house was extensively renovated a few years ago and has all the modern heating, hot water and bathing/showering, cooking and living facilities you'd expect of a modern property. The interior design is defined by a simple, stylish and tasteful elegance with traditional porcelain tiled floors and painted stucco walls - all common vernacular features in Italian rural villas. Top tip? Try a meal at Beppe's place some 100m away from Casa Paradiso. It's difficult to describe Beppe's restaurant since it doesn't fall readily into a category. Probably best described as a rustic or rural restaurant (though that's not entirely accurate!) Our family group was warmly welcomed even though he Beppe spoke not a word of English (his German is much better) breaching the language barrier with the warmth of his personality and generous hospitality. Do book ahead. You will not be disappointed. Casa Paradiso - aptly named. We booked Casa Paradiso for the May half-term school holiday for four adults and two children, aged 8 and 5. We all wanted to relax (apart from the children, of course!) and it turned out to be the perfect environment for us all. The garden was largely a wild-flower meadow at that time of year and the girls loved exploring it and playing on the swing/slide. The adults did a certain amount of enjoying the peace and quiet and views of the mountains from the garden but there was plenty of walking - gentle and otherwise - and villages to visit without even going to the Lake itself. We didn't do any sport but took a boat trip to the north end of the Lake one day - Riva del Garda and Torbole are interesting. We all walked to the top of Monte Bestone another day for fabulous views of the Lake and across to Malcesine. The Agriturismo Val d'Egoi (200 metres away) was brilliant - we had two really good meals there and the owner was really kind and helpful. The house itself was clean, spacious and well-equipped and the local manager responded to our initial queries promptly. The weather wasn't particularly warm when we arrived, although the days did warm up during the week, but the log fire was cheerful and cosy in the evenings. Although there are two supermarkets in the nearest village Vesio, the range of products is limited so I would suggest stocking up as much as possible at a bigger supermarket elsewhere. Casa Paradiso offers both peace and tranquility and access to activities and restaurants and we would recommend it. - Swimming. La Berna outside pool, gardens and bar and La Fenice hotel are both 5 minutes by car. - Tennis. There are a number of nearby tennis hotels offering courts and / or coaching (e.g. Hotel Pineta Campi). The nearest lake beach, at Limone on Lake Garda, is a 15 minute drive. Here you can walk along the famous promenade past restaurants and cafes, sunbathe, swim from the beach, hire paddleboats, windsurf or catch a ferry to other towns on the lake such as Malcesine on the eastern coast and Riva at the northern tip. Verona with its famous Roman arena, where operas are held in the summer, is around an hour and half by car. - Brescia (Montichiari airport) is 75km / 80 mins. - Verona (Villafranca airport) 110km / 100 mins. - Venice (Marco Polo airport) 220km / 150 mins. Booking Notes: The initial 25% payment is a non refundable deposit. The remaining 75% payment and a security deposit of £300 are payable 60 days before the holiday. Water, gas and electricity are included in rental. Oil central heating, if used, is charged at E1.50 per litre. Pets are £35 each per week. There is a 100E charge for cleaning, linen and towels which will be collected by the House Manager. The local region charges a Tourist Tax (2018) of Euro 1.50 per person per night. Children under 14 are excluded from the tax. The House Manager will collect this tax on your departure. Rental payments can be made in Sterling or in Euros either by credit card, bank transfer or the website payment system. Please see rental contract for full terms as the website contains only an incomplete summary. Changeover Day. Bookings are weekly from Saturday to Saturday - unless otherwise agreed with the owner. Arrival is between 18.00 and 21.00 hrs and departure before 12.00 hrs.